Bishop Cantú will succeed the present bishop of San Jose, Most Reverend Patrick McGrath, upon his retirement. A Mass of Welcome is scheduled for Bishop Cantú on Friday, September 28, in San Jose. Bishop Cantú remains the bishop of Las Cruces until September 28. 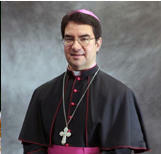 Bishop Cantú was appointed Bishop of Las Cruces on January 10, 2013 and was installed as the second bishop of the diocese on February 28, 2013, succeeding Bishop Ricardo Ramirez— who was the founding bishop of the Diocese of Las Cruces. During his tenure in Las Cruces, Bishop Cantú also served as the chair of the United States Conference of Catholic Bishops (USCCB) Committee on International Justice and Peace, where he paid solidarity visits to the Church in troubled parts of the world and advocated for policy to bring peace and justice to those areas. The Diocese of San Jose was established on January 27, 1981, just one year prior to the formation of the Diocese of Las Cruces. In San Jose, Bishop Cantú will shepherd a mostly-urban diocese that encompasses Santa Clara County—an area that is known today as Silicon Valley— with a population of over 688,000 Catholics.